Vesa 200 x 100 LCD Monitor Arm, AR021 - HIGHGRADE TECH. CO.,LTD. Highgrade is a professional manufacturer for LCD Monitor Stand, LCD Monitor Arm, Articulating TV wall mount brackets, Pad holder, Projector Mount in Taiwan. We insist of production in Taiwan to provide high quality with variety product choices with reasonable MOQ for customers. 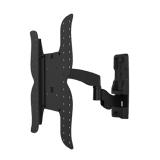 Tilt Monitor Arm / Monitor Wall Mount AR021 continue with the key features for AR011 but it is applied for vesa 200x100. It is aimed with monitor size from 24-32".